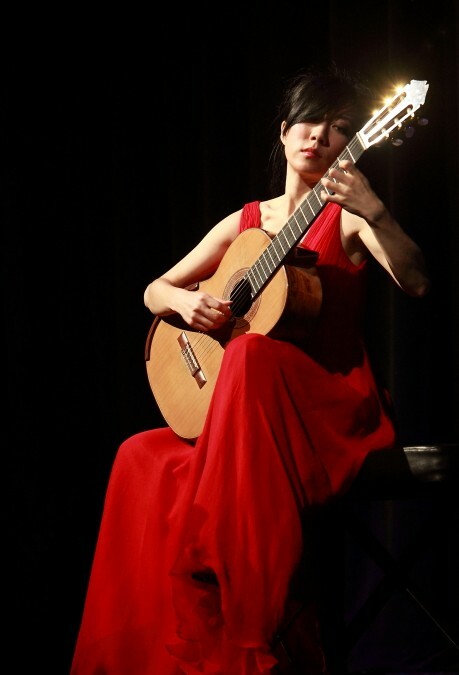 The story of Xuefei Yang is one of the most unique in the modern classical guitar world. She began her guitar studies at a young age, as most virtuosos do, but she did so in China at a time when the guitar was not highly regarded (In her own words, “not very high class”). Despite this and other obstacles (it was initially recommended that she play the accordion, but it was determined to be too big), her progress was so meteoric that she was soon playing for some of the best talents in the musical world, including composer Joaquin Rodrigo and guitarist John Williams. Amazingly, she became the first guitarist in China to enter a music school and the first to build a career as an international artist. She has won competition after competition and blazed a trail for many others in China (including the Beijing Duo who gave the first concert of our season) to follow. She has done all of this with steadfast and self-emanating determination. Following her conquest of Asia, Ms. Yang chose to move to Europe to continue her studies. There she became the first guitarist from China to study in the United Kingdom, and was also the first guitarist to receive an international scholarship from the Associated Board of the Royal Schools of Music for her postgraduate work at the Royal Academy of Music in London. Few guitarists of my generation have so many firsts to their credit as Xuefei. Though I had not followed her career closely, Ms. Yang was among a wave of younger guitarist who were coming to prominence while I was studying guitar at the university level. I have known her name for years and was very excited for the chance to speak with her. Our meeting did not disappoint. Xuefei is fiercely intelligent, thoughtful about her artistic intentions, and passionately effusive. In short, it was a great conversation. We settled into a cozy spot by the expansive pool at the Biltmore Hotel in Coral Gables, surrounded by the chatter of overly exuberant Miami Tourists and the warm rays of the December sun. I would have loved a margarita, but this was business. Daniel Shearouse: I guess the first thing I’m curious about is why you chose to be a touring artist. You could probably do anything you want. What is is about touring that you prefer over your other options? Xuefei Yang: Oh, I think it’s a privilege to have all of these opportunities to travel around! It’s actually not something like you think, “I want to tour”, and you can get it! It’s not, I believe, like if you say, “oh, I want to be a waiter”, and then you get that job. I don’t think there are lots of people that, if they wanted to be a touring artist that they can get it. So, I actually feel very privileged that I have this opportunity to go around. But, what makes it most rewarding is that I go to different countries, I’ve played in 50 countries, and sometimes I don’t know the language, I don’t really know the culture, and I cannot talk to people. But, through the music I can communicate and I can touch people’s spirit and that is very rewarding. DS: Speaking of the many different countries you’ve been to, have you experienced much culture shock? In particular when you first left China? XY: Yes, but it comes gradually. It’s not like I went to England and day one I had that culture shock. I actually didn’t have that! But, the culture shock comes gradually. Hey, you look cool! The afternoon sun had finally drifted too near the horizon and, though mortified, I had been forced to don my sunglasses. XY: Yeah, so I think, of course, there is a huge cultural difference, not just because I come from China but, even in Europe, if you go to the north and the south of the same country, they are so different. And, the rich culture and the variety of culture is one of the reasons I chose Europe to study. I think as an artist it is very important to understand the different cultures when you play the music of that culture. I think that to go to the higher level, it is very important to understand that. XY: Because of the different cultures, and the history of the music, and the heritage of the music, yes. DS: As far as heritage, you’ve mentioned before some of the differences between Chinese classical music and western classical music in terms of the horizontal nature of Chinese music versus the vertical aspect of western music. Besides those things, is there something you wish that your different audiences would understand better about the other side? Do you feel that Chinese audiences are missing something when you play western music and vice versa? XY: Oh, yes, definitely. Well, of course it’s different. When you play Chinese music for a Chinese audience, they know it because it’s their culture the same as if you go to Italy. Opera, for them, it’s just their culture. There is a difference, but it’s a fascinating thing. For the audience I think there is a different level understanding so I always like to introduce the music and introduce the background to help them understand it. DS: And, you’re doing a lot of arrangements yourself, right? DS: How do you feel about the different roles as an interpreter and a performer? Do you have a specific goal as an arranger? Are there different goals for western and Chinese pieces? XY: Yes, well whether it is a western or Chinese piece, I like to hold the spirit of the music and not to change it to make it like my composition! I try to keep the same spirit as the composer’s original work, but at the same time I think that we have to be careful to choose a piece to transcribe because not all music can be played on the guitar. Some wonderful music is just not suited to the guitar! I mean, you do it and it’s not fair for the music and not fair for the guitar. So, first we have to choose the right thing to do. Secondly, I think that as well as keep the original spirit, I like to present some of the guitar’s character, not just copy the original instrument. I think that if you just copy the original instrument, then what’s the point? So, I like to have something that you can only hear on the guitar or that can show the best of the guitar. So, that’s what I try to achieve. So, keep the original spirit and preserve the guitar’s character is what I try to have in the transcription. And I think it’s important that I do the transcription myself. During the process, I study the original score, I study the other transcriptions for other instruments. I know the music so well, I know the character so well. I know why I do it this way, why I keep this bass line, and I know how to interpret it my way. So, that’s why I do transcriptions myself. DS: Have you ever considered doing full compositions yourself? XY: Yes, that’s something that I definitely want to try in the future because composing is very creative. I think I will definitely try it. However, I don’t think I will be Beethoven! It is up to every guitarist to try and push for good music and play new music by good composers. I try to choose my program based on the audience I will play for. DS: What is there left for you to do that you still want to accomplish as a musician? XY: Oh, lot’s, I think! First, I want to be my at my best. I don’t think I’ve peaked yet and I’m curious to see what I’ll be like at my peak. I think I’m starting to find my own voice, so it’s very exciting. DS: As far as your voice is concerned, do you have different intentions when you are performing for an audience versus when you’re doing a recording? XY: Oh yes, I believe they are very different art forms. I usually think that live performing is like a stage drama, and a recording is like a film. For example on stage, they put on very dramatic makeup in order for the audience to see and they have to do it continuously. If anything goes wrong, you have to just go ahead. But film, it has to be natural. It cannot be as dramatic as on stage. So, I think recording and live performance are like that. In recording studios, the microphone is close to you so you don’t need to worry about volume and you don’t have to worry about projection, but you do worry about all the tiny noises! Also, all the nuances are very important for a recording. You have to give details and nuances that can be shown in a recording. But, in a live performance on stage, sometimes the nuances might be lost, especially when you play in a large hall. But, the tiny noises might also be lost! It’s a bigger scale. DS: You were the first guitarist in China to enter a music school. You left China alone to study in Europe. You tour extensively. How do you deal with the isolation that you experience? XY: You know, I never really thought about it! But, looking back, I have overcome a lot. I think it is mainly just the passion that I have for the guitar that drives me to keep going. DS: I feel like the guitar world can sometimes be too conservative. What would you change about the guitar world if you could or what can an average player to to improve the guitar culture? XY: Wow, these are hard questions! I think that all instruments have this problem. It is up to every guitarist to try and push for good music and play new music by good composers. I try to choose my program based on the audience I will play for. For instance tonight, since I will be playing at the university, I am playing a more challenging program because I know the audience can handle it. DS: On a lighter note, what’s the last movie you watched? XY: Oh, no! I’m not sure. No, wait it was Life of Pi. But, I saw it on an airplane. DS: That seems like it would ruin it! XY: Yeah, it was very small, but I still enjoyed it a lot. And, I liked how it blurs the lines between reality and dreams. It makes me think of how we see things through the media. DS: What question do you never want to be asked again? So, there you have it, future interviewers. That one is starting to get old. DS: Thanks so much for talking with me! XY: Of course, thank you!